Hi Authentique Fans!!! Are you anticipating that first day of school? I thought it would be a wonderful idea to welcome your teacher with a fun Studious Desk Organizer. It is really super easy to create. All you need is a 5" x 7" photo frame, some chipboard, adhesive and random embellishments to decorate with. The note book that fits is placed inside the organizer box is 4 1/2" wide x 7 1/2" long. The inside pages are made from copy paper and are just a tad smaller then the book cover. Tie page inserts inside decorated book cover with ribbon. They are easy to replace as teacher needs new inserts. To begin your Studious Desk Organizer cut one piece of chipboard to measure 2" tall and 7 3/4" long, one piece of chipboard to measure 1 1/2" tall x 7 3/4" long and two sides that measure 2" square along with an unfinished 5" x 7" wood frame. Adhere Studious Authentique patter paper to the outside of prepared frame. 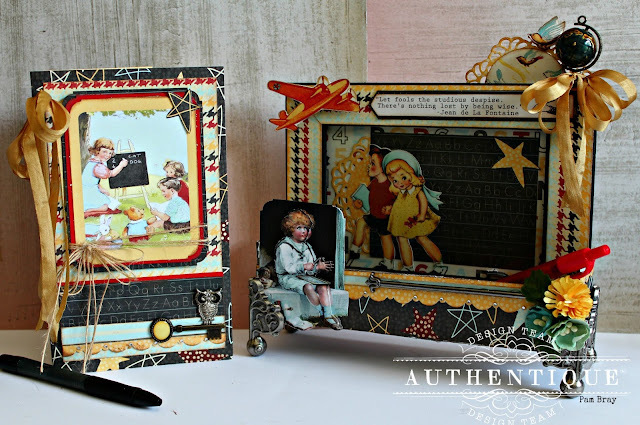 Add Studious pattern paper, Epherema Card, doily and a fussy cut image to inside of frame. Create organizer box with chipboard. *HINT: I used scored pattern paper or washi tape to hold on the parts together, making sure that everything is square and secure to the sides and back. Add the sentiment from the top of the paper to top of frame along with metal claw legs to box. Adhere a decorated doily to back of frame along with a fussy cut bird, bow and a small metal globe. 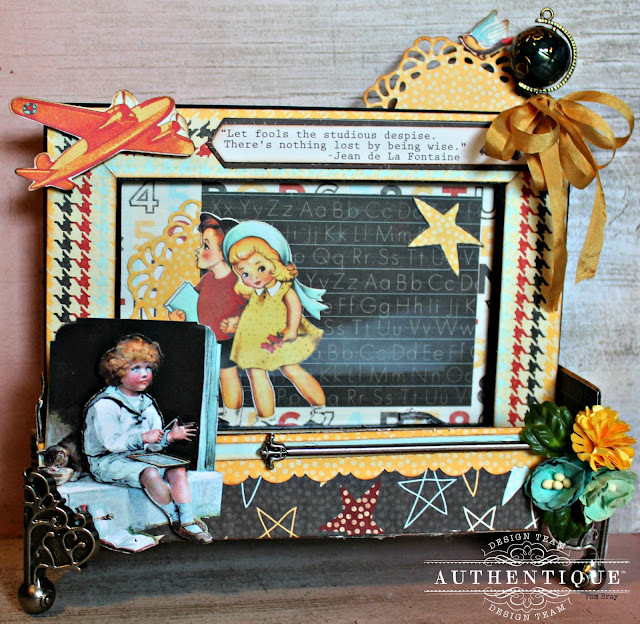 Add fussy cut airplane to top of frame with pop dots. Adhere fussy cut Epherema card to front of prepared organizer box along with a scallop border. Add a metal arrow and flowers to organizer box. Create a small 4 1/2" x 7 1/2" note book to fit inside of organizer box. 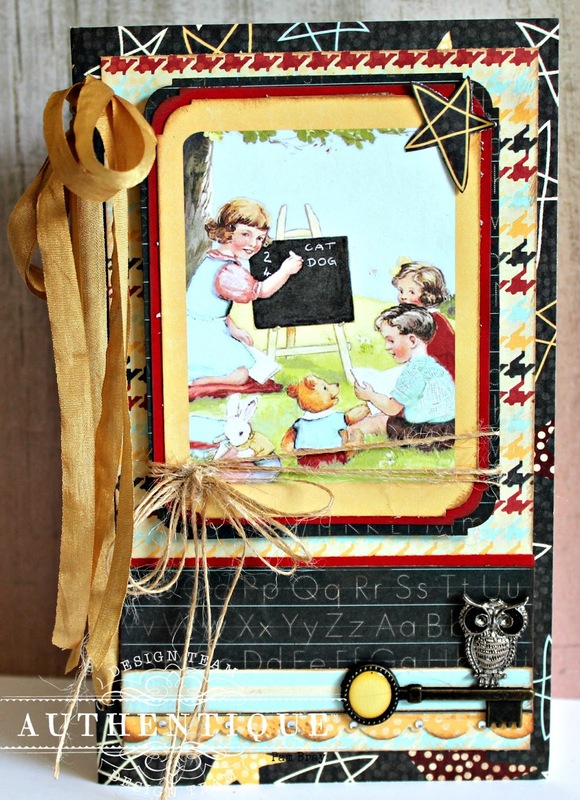 Decorate with matted Epherema Cards, small school type metals, and twine. Create pages from copy paper. Add to inside of book with ribbon. 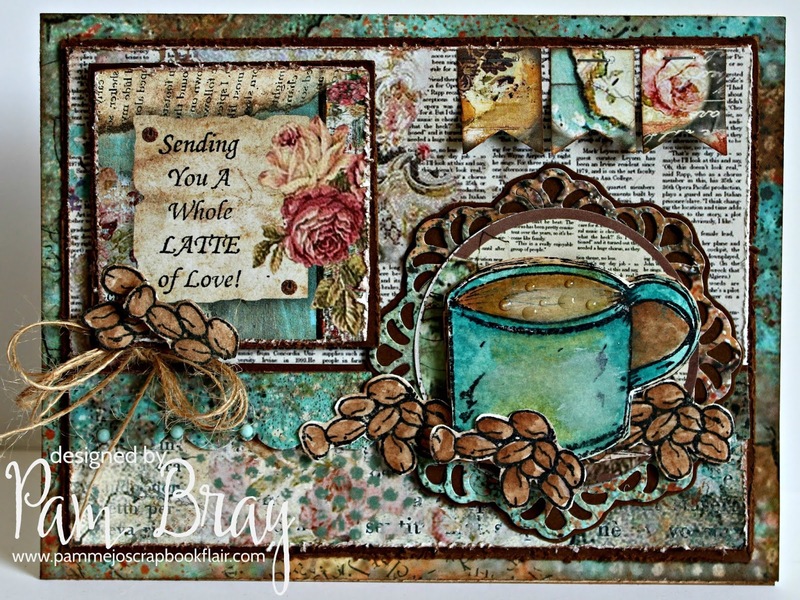 Today I am "Sending You a Whole LATTE of Love"! I am so excited to share projects of my "newest" stamp sets that are being manufactured by Emerald Creek Supplies! There is 6 sets in my Coffee Collection of stamps! So a "HUGE" selection to choose from! Today I am sharing one of the coffee cups from the Fireside Coffee Stamp Set and a sentiment from the Coffee Sentiments Stamp Set along with a few of my favorite projects like Clearsnap Colorbox Blends and Stamperia Pattern Papers. Begin by distress and inking pattern paper with distress tool and Clearsnap Colorbox Nutmeg Ink. Adhere to top of card base. Adhere small inked flags to top of card base with small stapler. Tip flags a bit at the end to make them look like the flying. Stamp cup twice from Fireside Coffee Stamp Set along with the beans stamp with black ink on watercolor paper. Apply Colorbox Blends Ink with water and paint brush; drying between layers of inks. Adhere doily to brown card stock. Fussy cut images out when dry. Layer two cups together with pop dots. Adhere fussy cut and inked beans around cup. and sentiment. Add small speckles of Crystal Lacquer. Dry. from Emerald Creek Craft Supplies. as well as local scrapbook stores in your area. to contact Emerald Creek Craft Supplies for products. Do you love to host parties, events or other social gatherings! 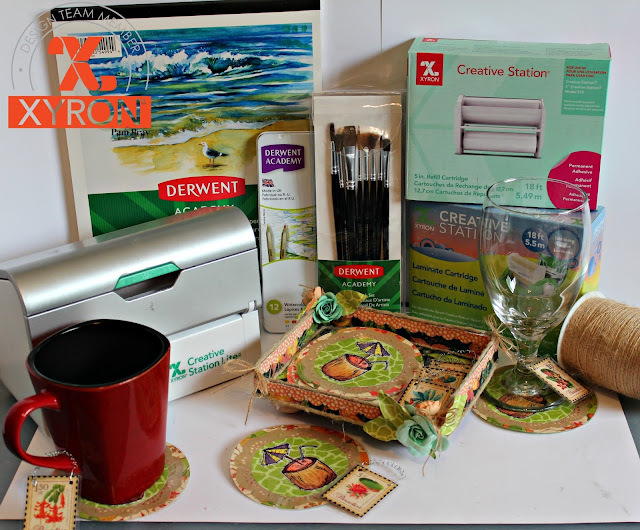 Coaster and Charm Set using Xyron Creative Station Mini with Xyron Laminate Refill Adhesive! Begin by stamping Tall Tropical Drink image on to Derwent Academy Textured Surface Watercolour Paper. Color stamped image using Derwent Academy Watercolour Pencils. 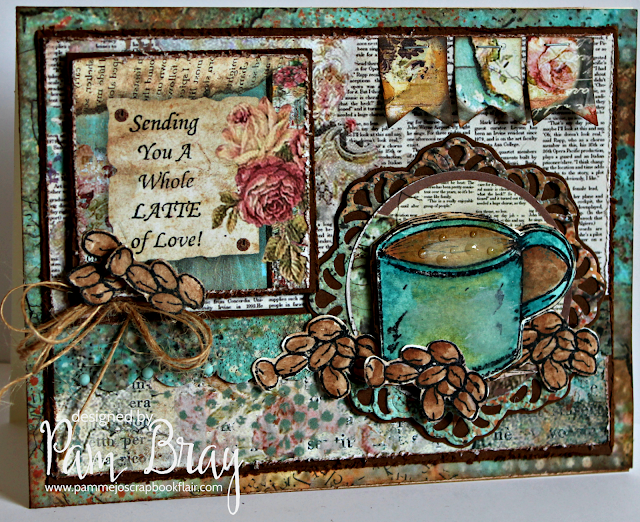 Blend colors together using Derwent Academy Artist Brushes. Fussy cut Tall Tropical Drink cuts out. Run paper doily, smaller circle and drink image through the Xyron Creative Station Lite using Permanent Adhesive. How to change the Xyron Permanent Adhesive Refill to Xyron Laminate Permanent Refill to create coasters. 1. 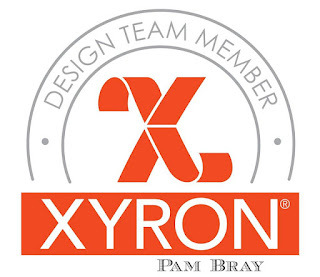 Lift lid of Xyron Creative Station Lite, remove Xyron Permanent Adhesive Refill. 2. Slide the Xyron Laminate Permanent Refill into Xyron Creative Station Lite. Shut lid. 3. 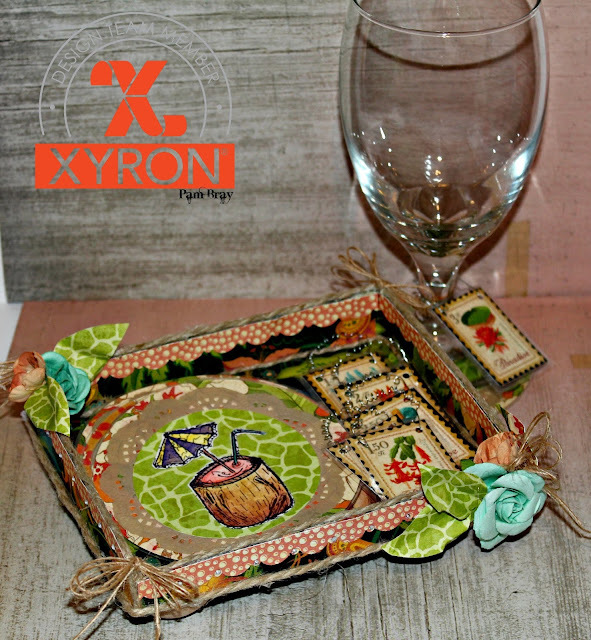 Place coasters through the Xyron Creative Station Lite. Remove access laminate from around coasters. 1. Open the packaging up for a Xyron 5" Refill Box. 2. Cut apart as shown in center photo. Cut sides to measure 1". 3. Form box with scraps of pattern paper and adhesive to secure sides of box. Add border strips to edges of prepared box. Add jute to edges of box. Add small twine box, flowers and leave to prepared box. Cut small postage stamps from the Tropical Travelogue; laminate. 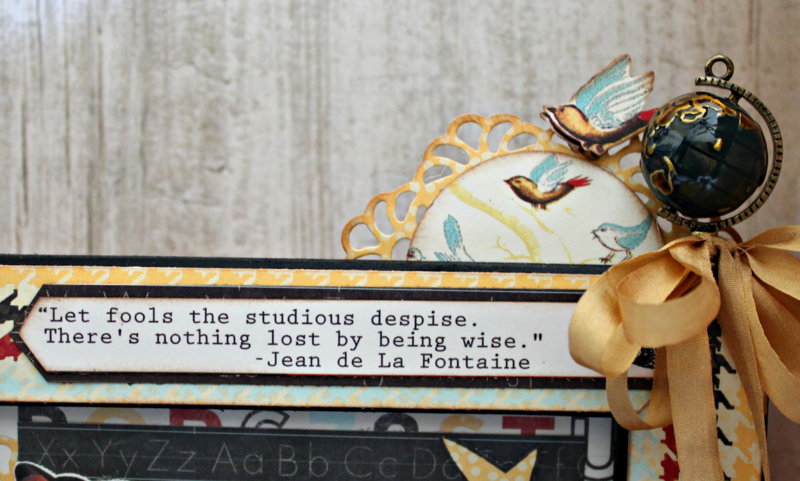 Add small wires to top of laminated pieces to create charms. Let the Halloween and Christmas Projects Begin!!! What better way to start but with Diamond Press and Authentique! Begin by adhering pattern paper to top of card base. Punch borders strips from card stock; stamp with background stamp. Stamp images to top of border paper with black ink; adhere to card. Adhere stamped borders under border strip. Stamp and die cut spider on pattern paper; add to top of card with pop dot. 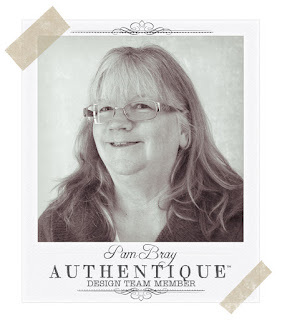 Stamp card stock with image; die cut. Die cut pattern paper out; layer together. Stamp image from Halloween Stamp and Die using black ink; die cut out; adhere to prepared frames. Finish card by hand cutting flag and stamping image to top. 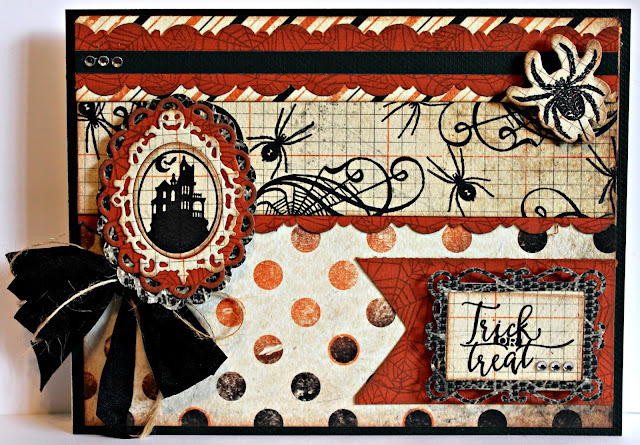 Stamp sentiment from Halloween Stamp and Die. Die cut frame and sentiment out; adhere together. Place on flag with pop dots.